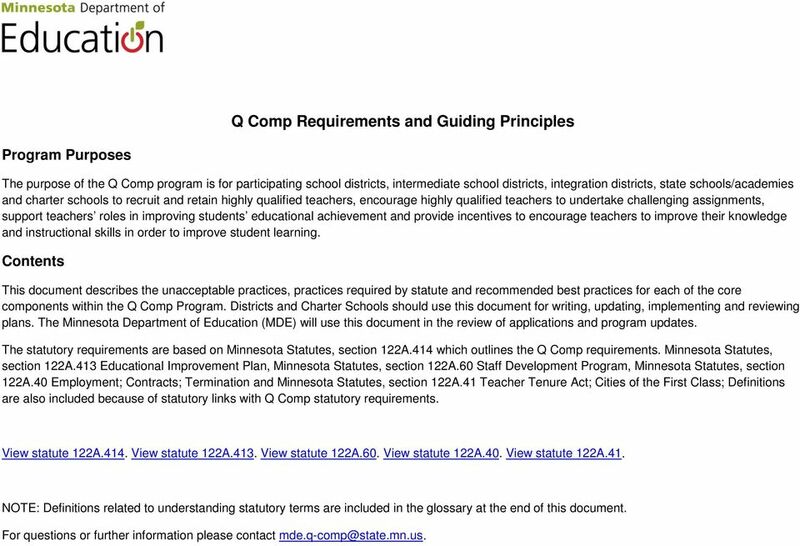 Download "Q Comp Requirements and Guiding Principles"
2 Core Component: Career Advancement Options Statute: 122A.414 Subd. 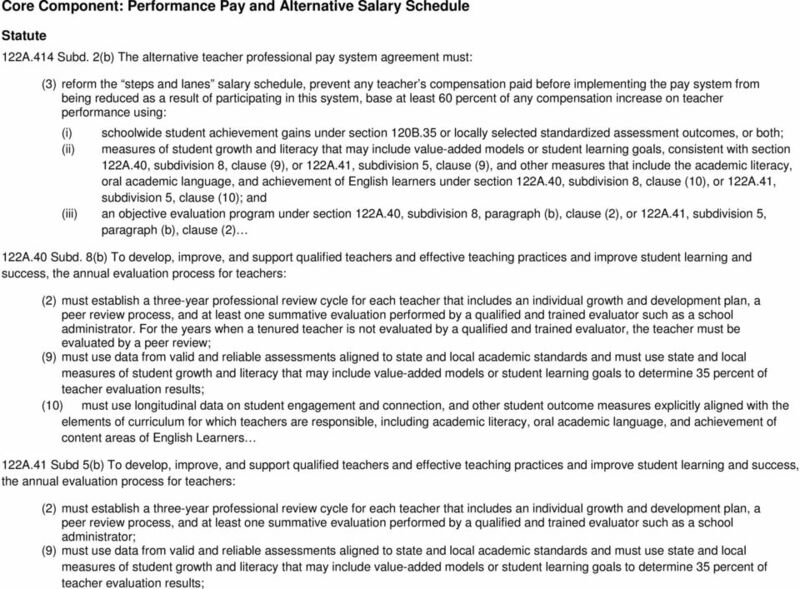 2(b) The alternative teacher professional pay system agreement must: (1) describe how teachers can achieve career advancement and additional compensation; (2) describe how the school district, intermediate school district, school site, or charter school will provide teachers with career advancement options that allow teachers to retain primary roles in student instruction and facilitate site-focused professional development that helps other teachers improve their skills Unacceptable Practices Practices Required by Statute Recommended Best Practices The plan describes teacher leader (career ladder) roles that licensed staff members may assume, while maintaining a primary role in instructing students, and outlines the additional compensation provided for these responsibilities. Teacher leader roles are focused on facilitating site-based professional development to help other staff improve instructional skills. 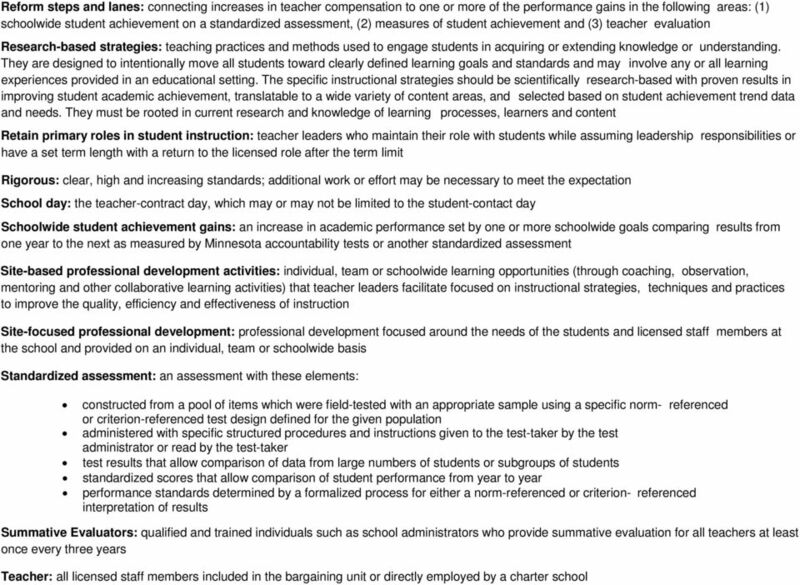 Teacher leader roles are unclear or are not focused on supporting other licensed staff members to improve instructional skills. Teacher leaders are released from the classroom without term limits in the positions. 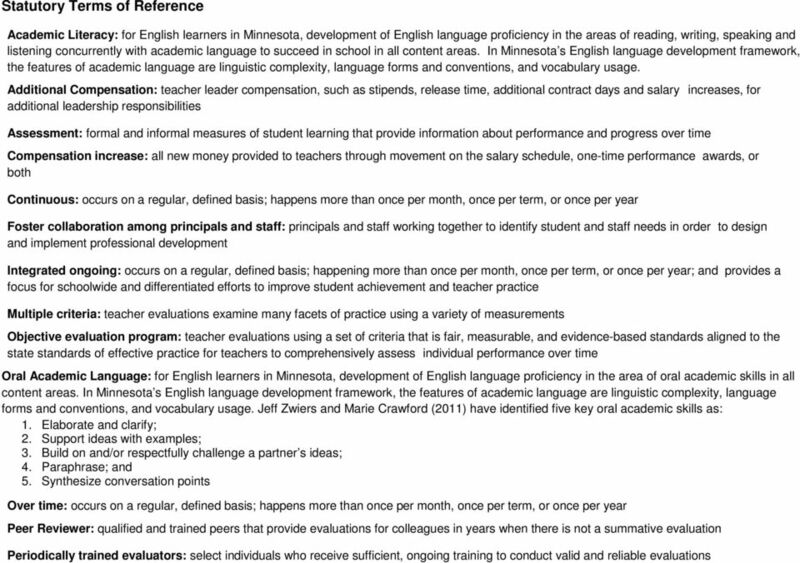 Teacher leaders are provided with only existing salary with no release time or additional compensation for the leadership responsibilities they assume. 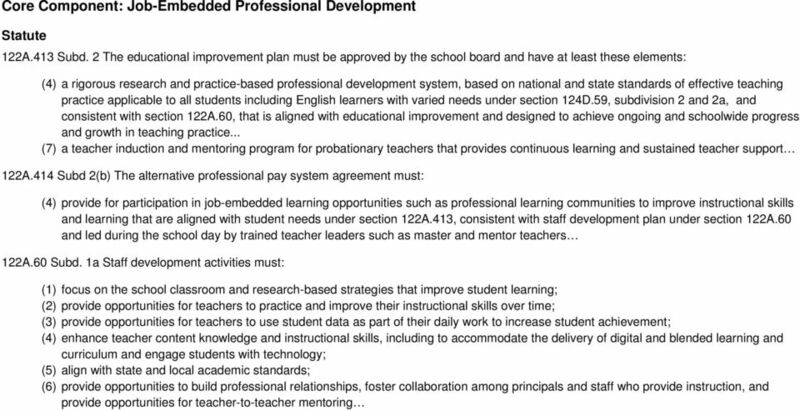 The teacher leader roles and job descriptions are posted within the district. The selection process includes an application process and a personal interview. 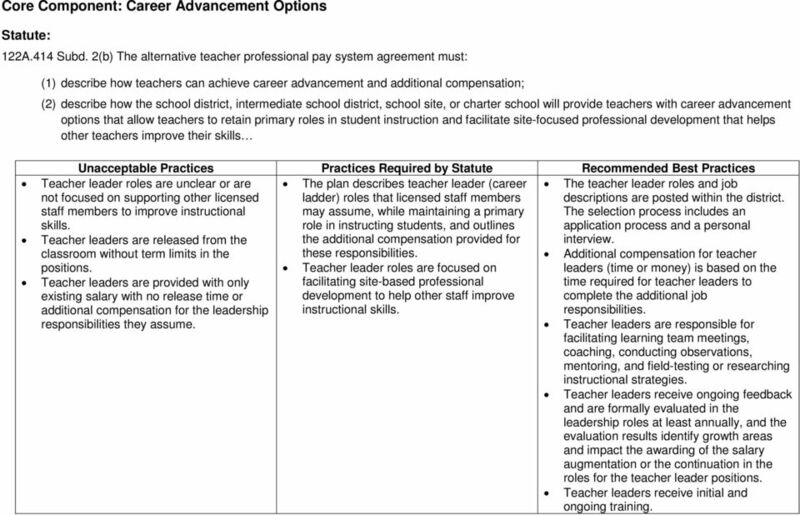 Additional compensation for teacher leaders (time or money) is based on the time required for teacher leaders to complete the additional job responsibilities. Teacher leaders are responsible for facilitating learning team meetings, coaching, conducting observations, mentoring, and field-testing or researching instructional strategies. 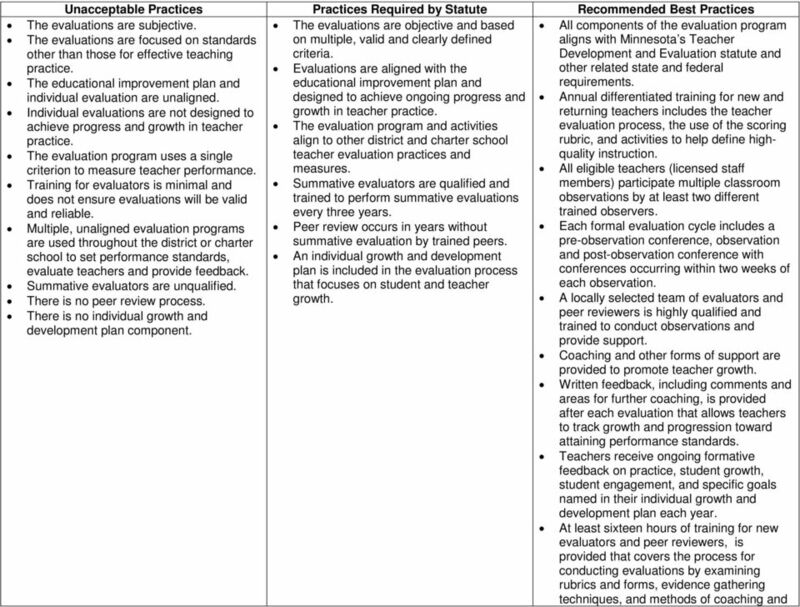 Teacher leaders receive ongoing feedback and are formally evaluated in the leadership roles at least annually, and the evaluation results identify growth areas and impact the awarding of the salary augmentation or the continuation in the roles for the teacher leader positions. Teacher leaders receive initial and ongoing training. 4 Unacceptable Practices Practices Required by Statute Recommended Best Practices Licensed staff members receive ongoing, site-based professional development facilitated by trained teacher leaders. Professional development is designed to improve content knowledge and the instructional skills of licensed staff members to increase student achievement through the examination of data and professional learning. Professional development occurs regularly during the school day through individual, team and schoolwide learning activities and allows licensed staff members to improve instructional skills to meet identified student needs. Professional development is collaborative in nature and builds professional relationships among staff members and with administrators. Professional development is aligned with district and site staff development plans and state and local academic standards. A teacher induction and mentoring program is in place to provide continuous learning and sustained support to probationary teachers. Professional development focuses on the needs of all student groups. Staff uses data frequently. 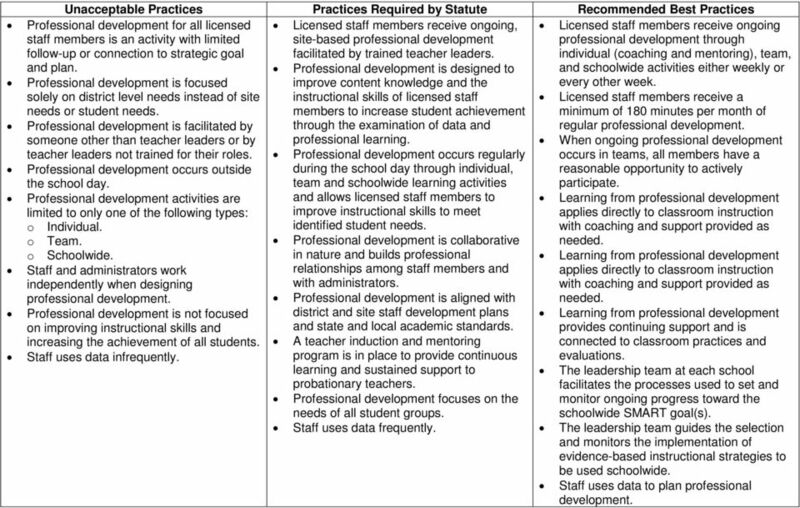 Professional development for all licensed staff members is an activity with limited follow-up or connection to strategic goal and plan. Professional development is focused solely on district level needs instead of site needs or student needs. Professional development is facilitated by someone other than teacher leaders or by teacher leaders not trained for their roles. Professional development occurs outside the school day. Professional development activities are limited to only one of the following types: o Individual. o Team. o Schoolwide. Staff and administrators work independently when designing professional development. Professional development is not focused on improving instructional skills and increasing the achievement of all students. Staff uses data infrequently. Licensed staff members receive ongoing professional development through individual (coaching and mentoring), team, and schoolwide activities either weekly or every other week. Licensed staff members receive a minimum of 180 minutes per month of regular professional development. When ongoing professional development occurs in teams, all members have a reasonable opportunity to actively participate. Learning from professional development applies directly to classroom instruction with coaching and support provided as needed. Learning from professional development applies directly to classroom instruction with coaching and support provided as needed. Learning from professional development provides continuing support and is connected to classroom practices and evaluations. The leadership team at each school facilitates the processes used to set and monitor ongoing progress toward the schoolwide SMART goal(s). The leadership team guides the selection and monitors the implementation of evidence-based instructional strategies to be used schoolwide. Staff uses data to plan professional development. 7 Unacceptable Practices Practices Required by Statute Recommended Best Practices providing feedback. At least eight hours of annual training for all evaluators and peer reviewers occurs annually and includes one or more highquality, inter-rater reliability activities. Evaluators and peer reviewers are required to demonstrate inter-rater reliability on an ongoing basis. 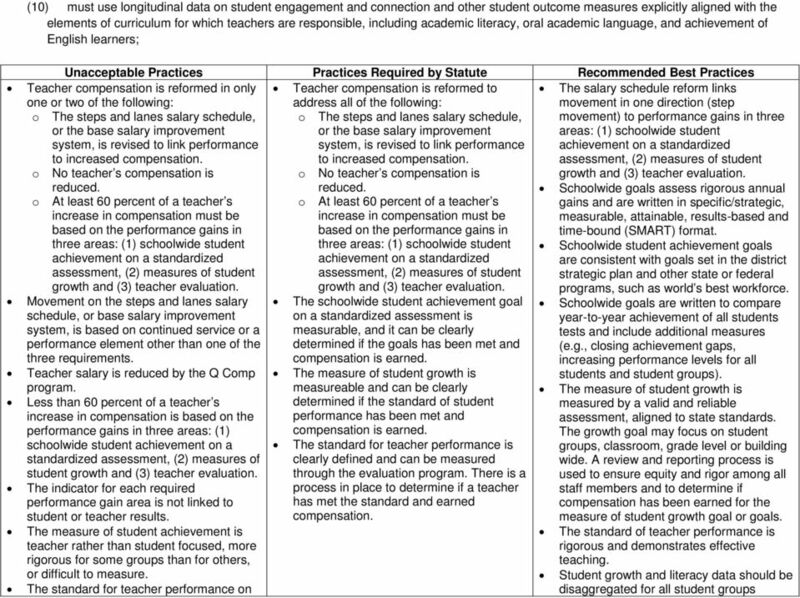 The rubric for teacher evaluations aligns with state standards of effective practice for teachers and includes three or more performance levels that are clearly defined. 10 Unacceptable Practices Practices Required by Statute Recommended Best Practices evaluations is subjective and applied including English Learners. inconsistent.